GREAT FOR GOLD OR RELIC HUNTING! 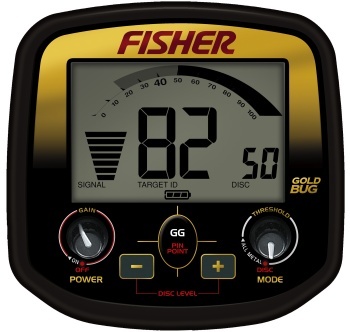 The controls and features are tailored to gold prospecting, including a sophisticated ground balancing system, separate control over signal gain and threshold, and a unique discrimination control system.These features also make for a great relic-hunting detector, especially when the Gold Bug Pro is outfitted with the optional 11' DD search coil.While the Gold Bug Pro makes for a highly competent Coin-shooting detector, its user interface and features are not specifically designed for this purpose. As a coin-shooter, you will notice that the Gold Bug Pro exhibits slightly lower sensitivity to high conductivity coins, like a U.S. quarter; this is a result of its specialized design to emphasize sensitivity to small low conductivity metals like gold nuggets. The Gold Bug Pro is outfitted with a small 5' search coil as standard equipment since this search coil construction is best-suited to finding gold nuggets. You may be familiar with other metal detectors which have larger search coils, generally in the range of 8 to10 inches in diameter. Large coils are designed to cover the maximum amount of ground efficiently and for the deepest ground penetration.Small search coils, intended for gold prospecting, are designed for precision. The Gold Bug Pro’s small DD search coil makes pinpointing easier, fits into small spaces where gold is often hidden, is better suited to penetrate highly mineralized soils where gold is frequently found, and has the highest possible sensitivity to tiny gold nuggets.